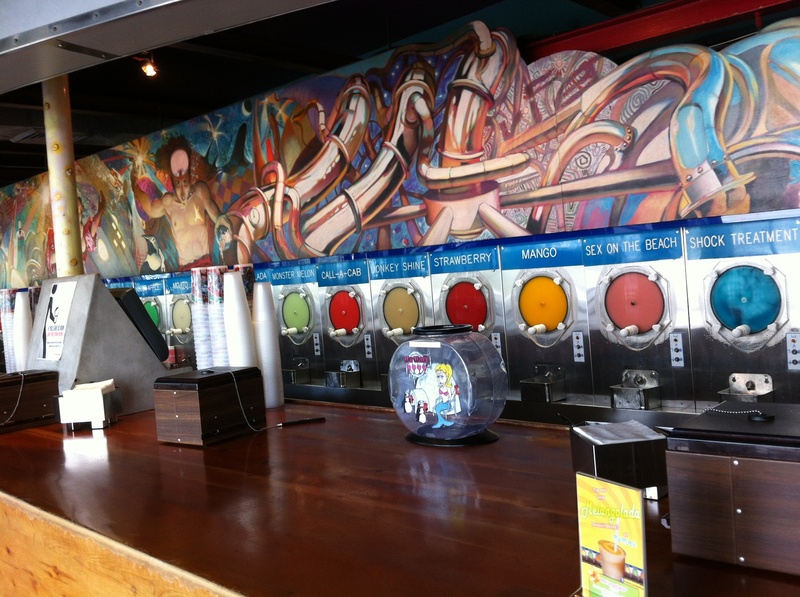 At about 1:45 I went to CJ’s Crab Shack for lunch. I got the Crab Cake Dinner, and it was good. They add 18% gratuity no matter how big your party is and my total came to $34.23. 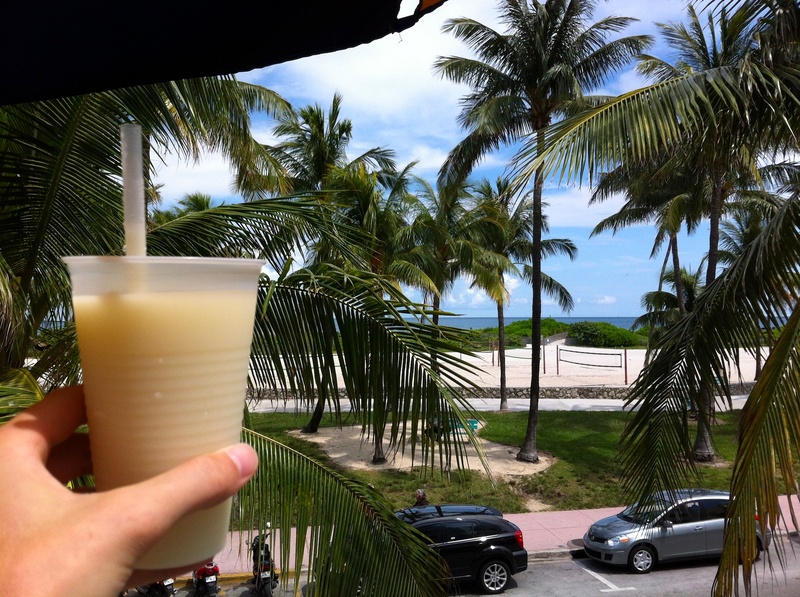 Expensive but every place on Ocean Drive is expensive. 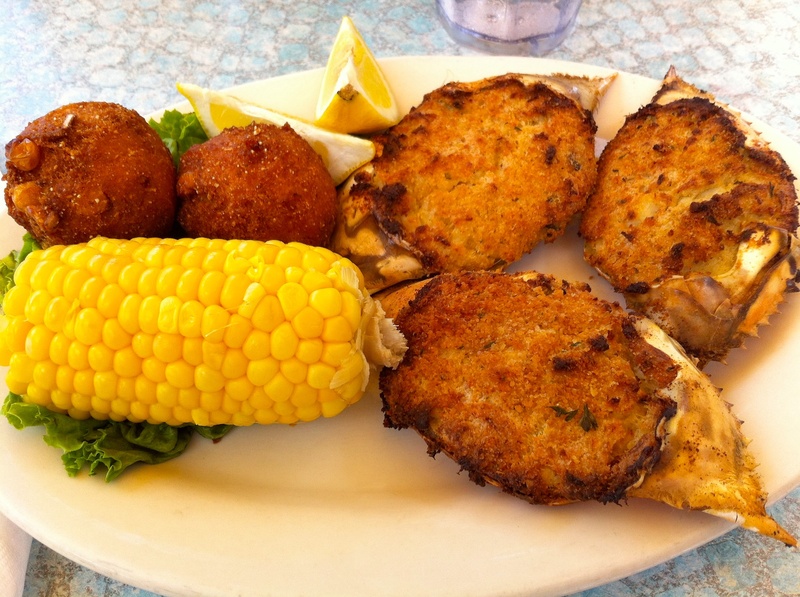 At CJ’s they take the meat out of the crab, do whatever it is they do and then put the mixture back into the shell and cook it. I chose corn on the cob and hush puppies as my side. 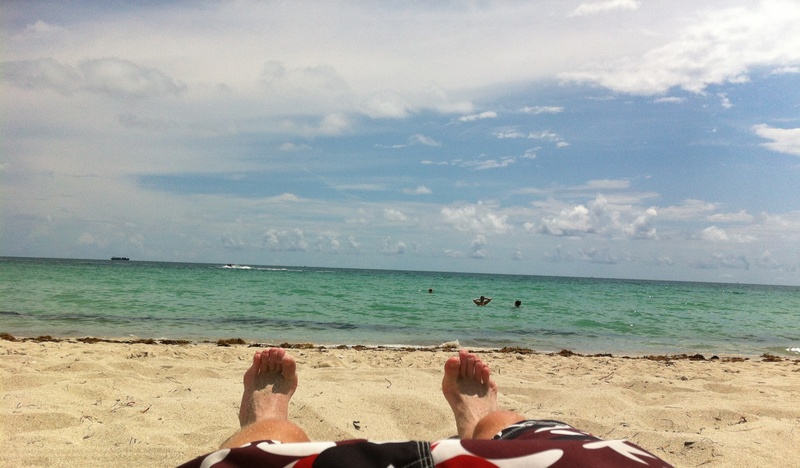 I got on the bus at 3:15 and rode it back to downtown Miami. I got ready for the game and took a 5:20 bus to Marlins Park. 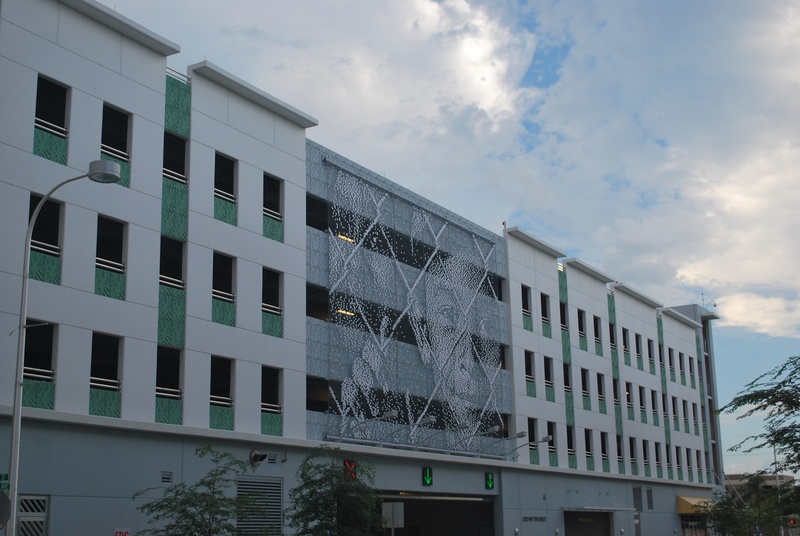 While I was waiting for my ticket at will call I noticed that they have this on one of the parking garages, not sure if it is someone in particular or not. I got my ticket from will call at 6:10 and went inside. 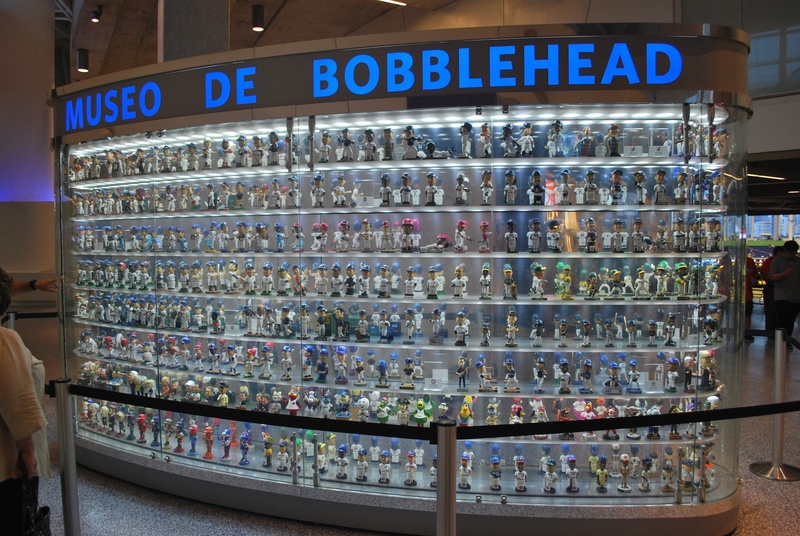 They have a “Bobblehead Museum” on the main concourse of the stadium. I put it in quotations because it’s really just a giant collection, and I mean GIANT. They have so many that they can’t hold them all in the two-sided display structure and they periodically switch them out. If you look closely at the first picture you can see a couple of the racing sausage bobbles on the second row in the bottom left (the pole covers them up a bit). 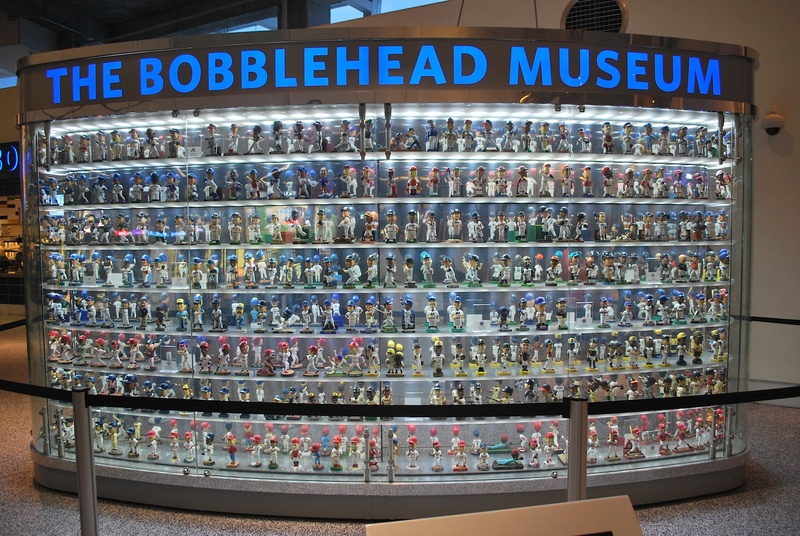 The bobbleheads are all on shelves that shift every so often so that the bobbles actually bobble. 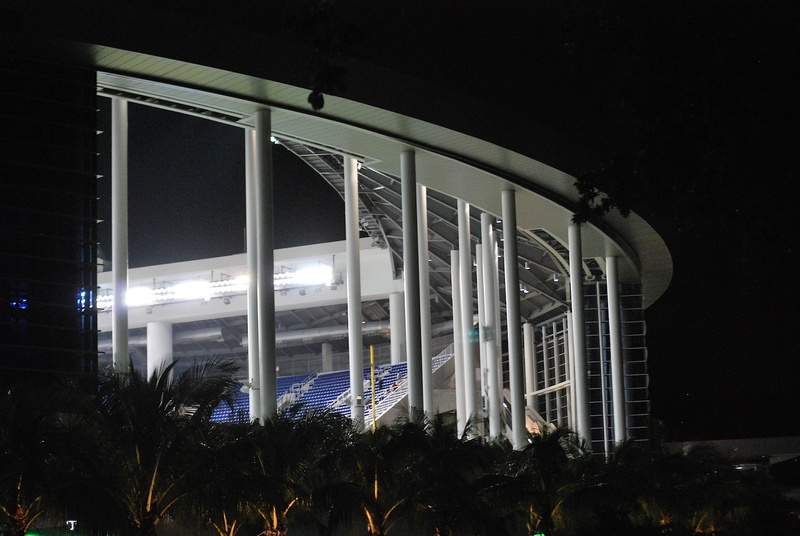 Well done, Marlins, well done. 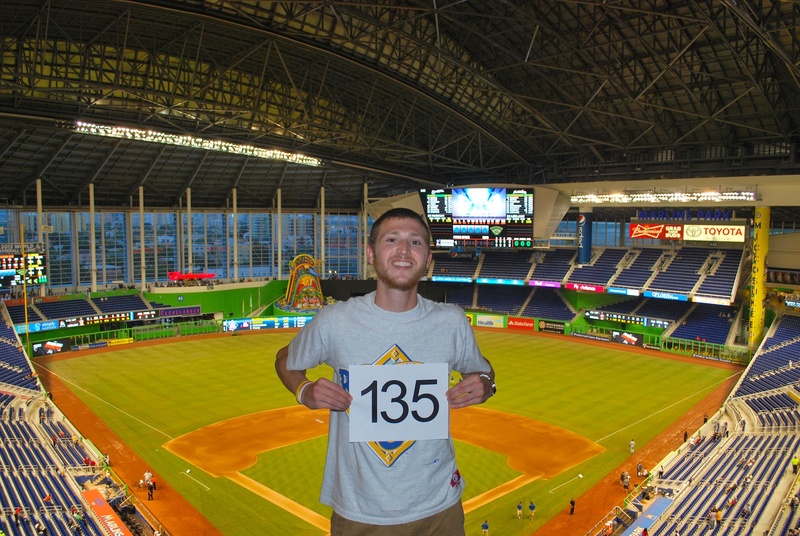 I went to the upper deck to get game photo number 135 taken. I asked a nearby Marlins fan, who I found out is Zach, to take it for me. Thanks Zach! Zach was with four or five girls and they all were 18 or 19 (I would guess). I walked over, gave them each a business card and told them about Be The Match and how easy it is to join the registry. I saw them in the concourse a little later and one of the girls said she would be joining the registry. Nice! 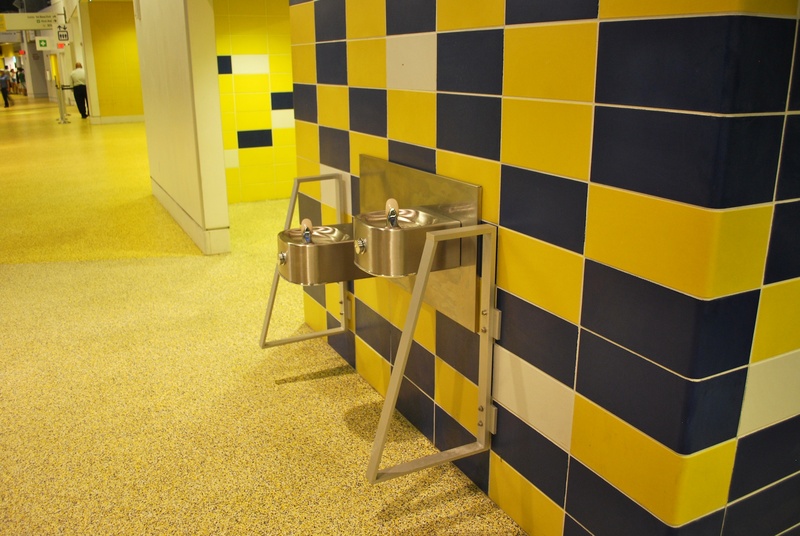 While walking around in the upper deck I noticed guard rails protecting the water fountains. 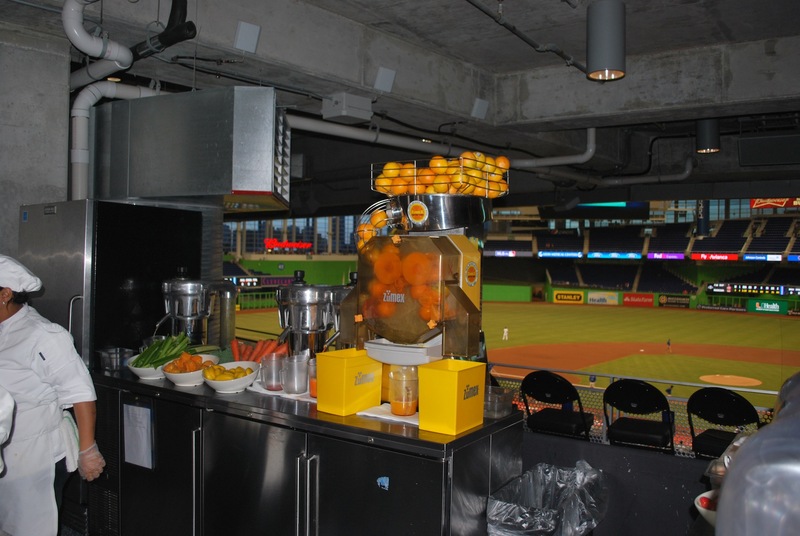 I’m not sure if running into fountains is a regular occurrence at ballparks but at Marlins Park they are protected in case a service cart driver loses control. I saw a Sushi stand nearby and I considered getting a roll. $12 seemed a little pricey but it’s in a ballpark, I don’t know what I was expecting it to be. It came with a little wasabi packet and soy sauce packet. I think I put a little too much wasabi in the soy sauce the second time, because after dipping a piece in the mixture and putting it in my mouth I could feel the heat in my nostrils. Overall the spicy tuna roll was very good. 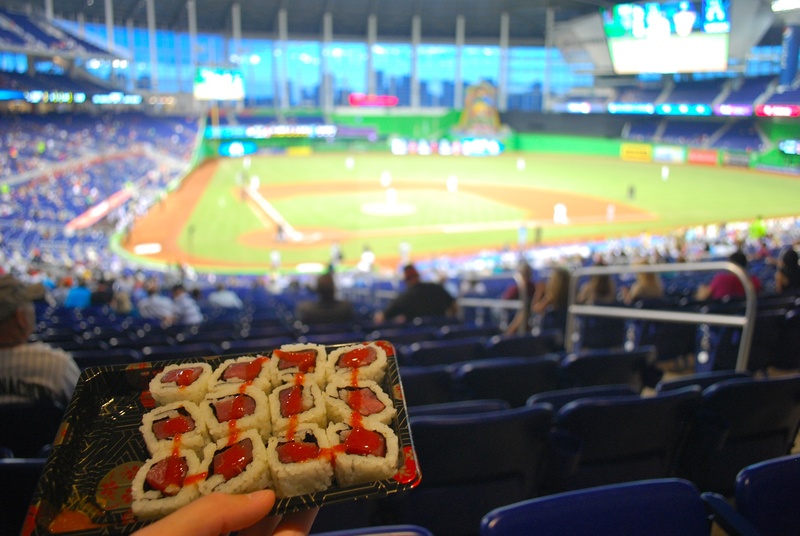 I never thought I would use chopsticks at a baseball game, but I did. The game started and Wade LeBlanc threw a strike to Aoki. 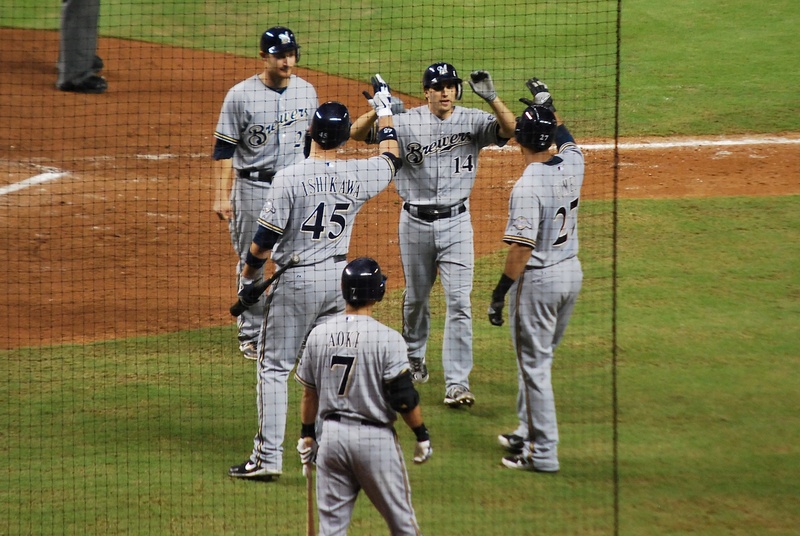 A Ryan Braun single scored Ricke Weeks in the 1st and the Brewers had an early 1-0 lead. Bang! The ball cleared the right field fence and went into the Brewers bullpen. 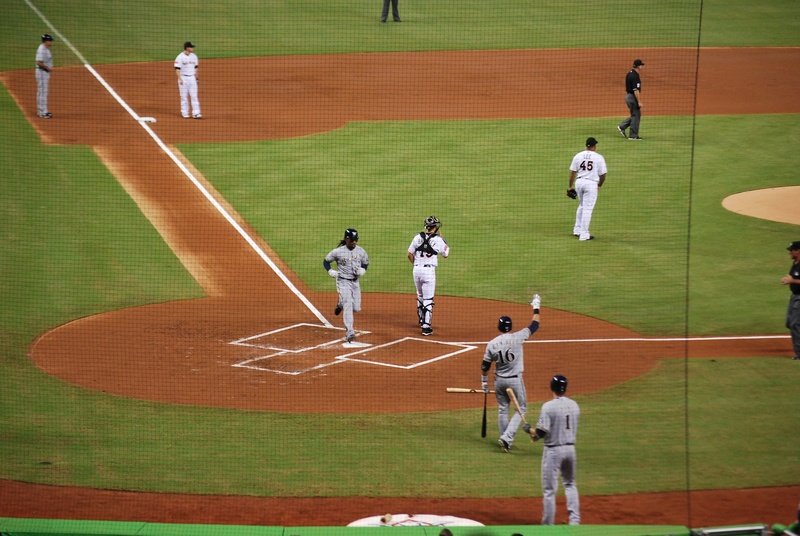 The Crew had a 3-0 lead once Aoki crossed the plate. Marcum is giving Aoki the finger-mustache thing and he returned the gesture (not pictured). 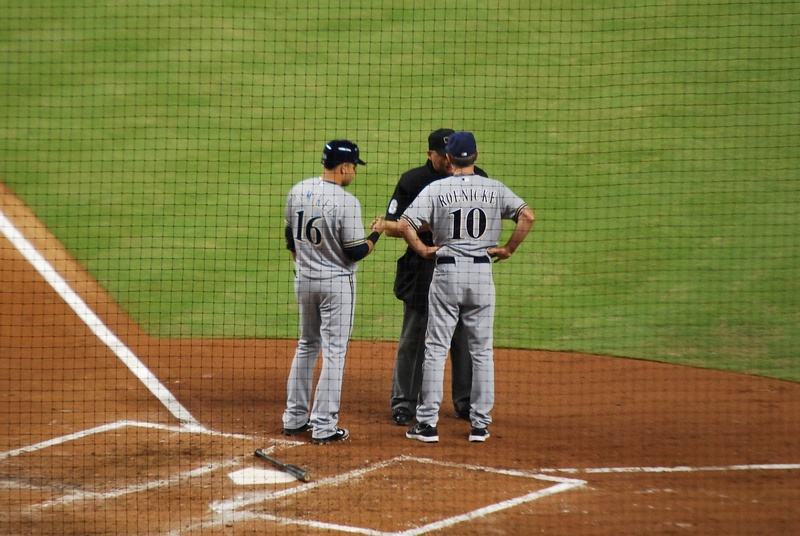 The first base umpire came in to talk (I’m guessing he’s the crew chief) and then all four umpires had a pow-wow near the pitcher’s mound. They came to the conclusion that it didn’t hit Ramirez, or maybe that even if it did it also hit the bat. I don’t think Ramirez would take off his batting glove and show the umpire if it didn’t appear he had been hit. It was a weird situation all around. In the 4th Giancarlo Stanton (who is a man-child at the age of 22) hit a bomb over the wall in center. The centerfield wall is 418 feet away so it was hit extremely well. The home run cut the deficit to one but more importantly I got to see the home run sculpture do its thing. 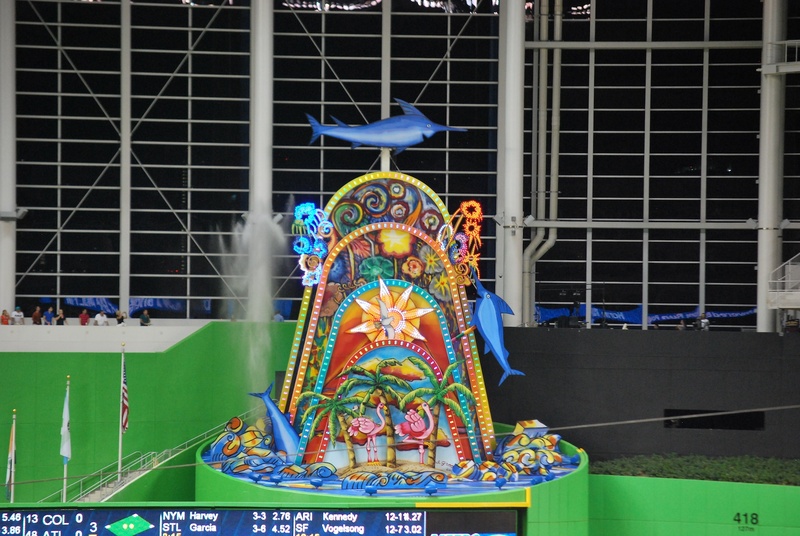 It lights up, the Marlins go around on a track and water shoots up from the side. 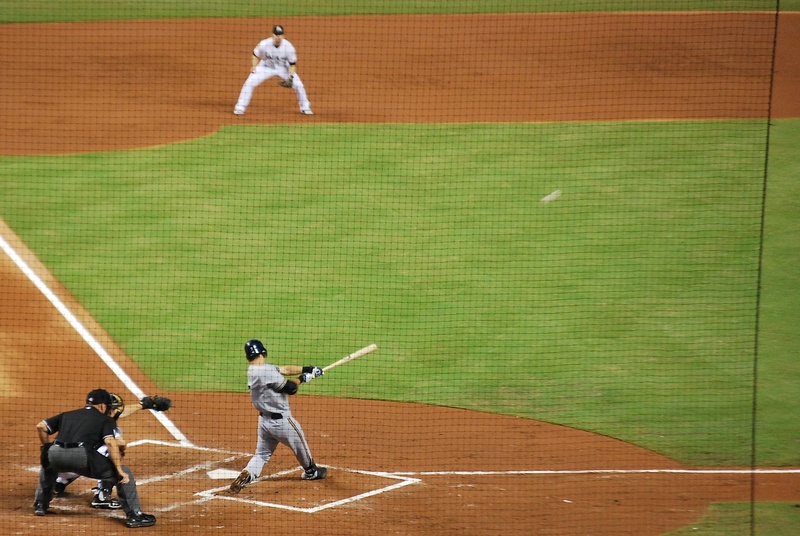 If you look closely at the picture above (you might have to click on it) you can see the ball in foul territory above Braun’s left (front) foot. It had a bunch of spin on it though and it rolled in the grass down the third base line for the go-ahead RBI. In the boxscore it’s the same as a line drive base hit. The 5-4 lead didn’t last long because Jeff Bianchi hit a 3-run home run in the top of the 8th to increase the lead by 300%!!! A.J. Ramos pitched the top of the 9th inning and was making his major league debut. 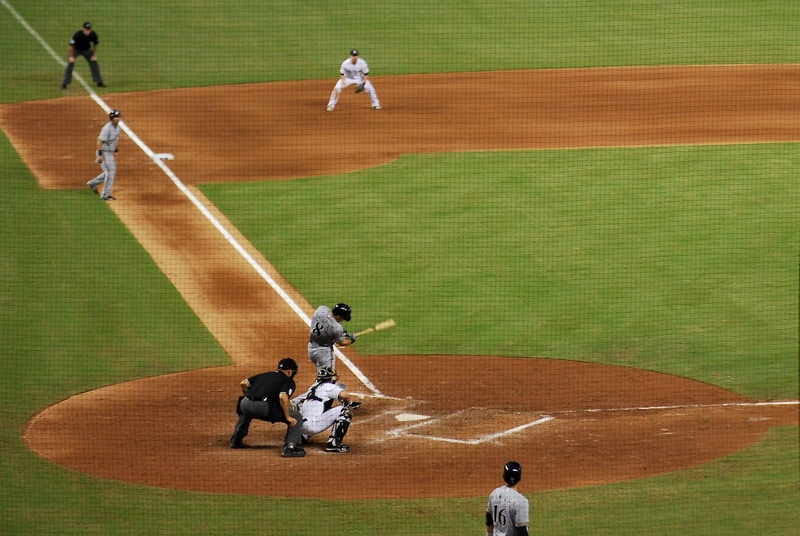 The first three batters he faced were Rickie Weeks, Ryan Braun and Aramis Ramirez. What did the rookie do? He struck them all out, now that’s an impressive feat. Veras came on to pitch the bottom of the 9th and struck out two of the four he faced but the other two walked and singled, respectively. 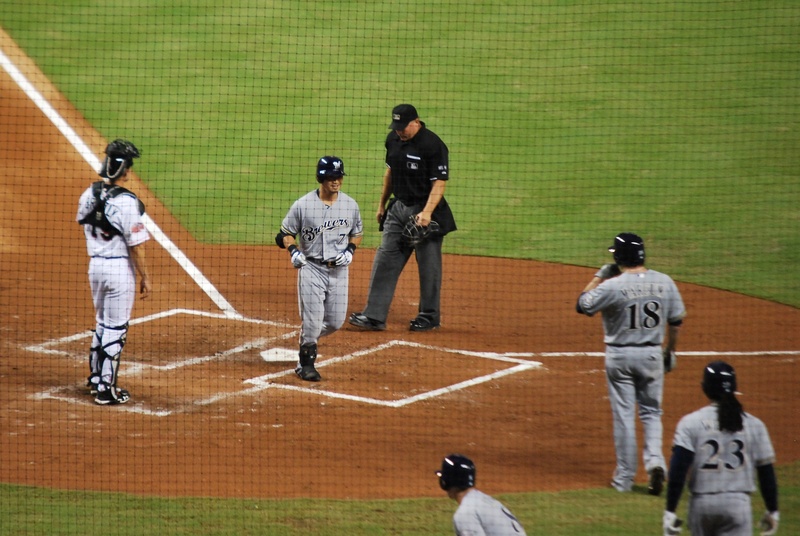 The single with two outs made it a save situation (since the tying run was in the on deck circle). Axford came in and retired the only batter he faced to pick up the save. 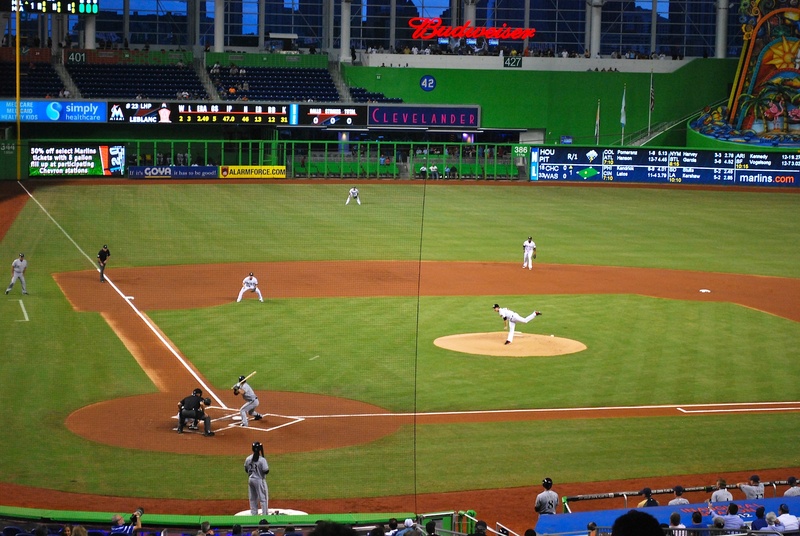 Final Score: Brewers 8 – Marlins 4. On my way to the bus stop I looked back at the stadium and noticed that the panels and roof were open. If I would’ve known they were going to open them after the game I might have stuck around to see them in action. I took the 11 bus back to my host’s place but just over halfway there the bus driver stopped at a corner and got off the bus. I thought I heard something about “a smoke” but I wasn’t sure. There were two other riders on the bus but they got off after a minute or two of us just sitting there without a driver. I waited probably five minutes and then decided to walk the 8/10 of a mile back to Claire’s. I had no idea if that was smart or not because I’m not familiar with Miami or the neighborhoods. One block down the bus zoomed past me and I felt like a chump. At one point I saw a tiny lizard on the sidewalk (which was pretty neat) and literally 2 seconds later a cockroach scampered past (not neat). It’s after 10:30 AM on Wednesday and I’ll be throwing out a first pitch in less than nine hours. I’m trying to decide if I should do the fake to third, look at first move while on the mound, but I’m thinking I might get booed.